One of the most powerful ways of communicating with potential customers of your business is via a website, a website can be a very cost efficient form of advertising and a great source information for your clients about your services, we have a range of our own premium web addresses that were registered for our own use but are now surplus to our current needs and are available for very reasonable prices, all domain purchases include the cost of transfer into your name (which is charged by the domain registrar) and can cost up to $100, we absorb the domain transfer costs. Explanation: We rated the domain for how closely it describes Cosmetic Tattoo services. 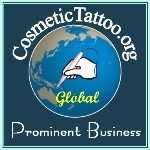 Explanation: We rated the domain for how useful it would be for marketing Cosmetic Tattooing services. Explanation: We rated the domain for how easy the name would be to remember and or recall by customers. Its worth remembering that in the aftermarket the .com domains can fetch considerable prices if they are premium names and the same can be true of premium second level or country specific top level domains, the best domain names are usually already taken so this is a great opportunity to grab your own premium domain. NB. Restrictions apply to .com.au domain ownership so please check before purchasing click here for more information, please ensure that you provide us with accurate information for your domain registration as additional charges may occur for some changes, the details supplied in your CTshop account will be used unless you inform us otherwise at the time of ordering.